That classic recipe for getting rich quick is one-handed down for generations, a potent mixture of good ol’ American optimism, a sprinkling of superstition, a dash or two of ignorance, seasoned liberally with magical thinking. As an ailing middle class watch’s the promise of the American Dream slip through their fingers, is it any wonder the appeal of the big payoff promised by multi million dollar lotteries? But the fun and games part obscures the more nefarious side of these ventures. Lotteries exploit the desperation of the powerless who feel themselves at the mercy of forces they neither control nor understand. How many number of genuinely poor people spend an astonishing percentage of their scarce discretionary income in the lottery? For millions of Americans stuck in various kinds of low-wage, no-benefit, dead-end employment, the infinitesimal chance of winning the lottery provides the only hope they have of changing their economic circumstances in a meaningful way. The promise of a new and better life has always been irresistible. Who could resist a shortcut to the American Dream? Before the state sponsored lotteries, corporate advertisers regularly sponsored contests offering spectacular prizes worth thousands of dollars. But these sponsored contests didn’t rely on mere chance. Unlike the no fuss, no muss, luck of the random draw lotteries, corporate sponsored contests required actual skill. Participants, generally housewives, needed to rely on their wits, their writing skills, and originality. Whether the contest required the participant to finish a rhyming jingle, complete the last line of a limerick or offer glowing testimony on the sponsors product chance and luck appeared to take a backseat to true creativity. Evaluated by a team of “discerning” judges the entries were chosen on sheer cleverness. In 25 words or less, a quick-witted homemaker waxing poetically about the virtues of the latest wash-day miracle stood to move her family to easy street. Winners could be showered with a never-ending supply of luxury goods from appliances, swimming pools, mink coats, and cars to mobile home, boats and even oil wells. Or a lifetime free of money worries. Bendix Washer Contest 1948 “Win a 12 day cruise to Hawaii for 2. First prize every week for 6 weeks during this thrilling contest. A big, beautiful 4 door sedan Hudson Sedan every week for 6 weeks. And that’s not all! TV sets , radios , famous name refrigerators big roomy with frozen food compartments, 10 4th prized electric ranges, 10 Simmons electronic blankets, 10 Cory automatic coffee brewers makes perfect coffee automatically, 25 toastmaster automatic pop up toasters, 10 General Mills Tru heat irons, and 15 Parker Vs Fountain pen and automatic pencil sets. And unlike radio or TV game shows, anybody could play without ever leaving the comfort of your home. A handwritten entry full of pep, perseverance and proof of purchase, along with a U.S. stamp to mail it were all that were required for the chance of a lifetime of abundance and security. During hard times when many had fallen off that track, promotional contests could be a life line. Corporate sponsored contest began in earnest during the dark days of the Depression. Popularized by radio shows, these contests offered hope and practical, cash relief to a struggling population who needed money just to make ends meet. The largest steady income ever offered in a contest of this type – because it’s sponsored by not one but 2 famous products. They have put in all their prize moneys to make this a truly sensational contest! Think of what you can win. An assured income of $30 every week as long as you live – paid to you by the great Northwestern Mutual Life Insurance of Milwaukee. Like many middle class housewives in the 1930’s Faith Lowe felt she was falling. Forced to economize, the Flatbush housewife scrimped and saved. She patched her families clothes and darned their socks. Careful to conserve precious cooking gas by warming up several leftovers in a three-part Depression pot, she became a wiz at preparing budget conscious meals. Smart cookie, she stuck to her budget by steaming unused stamps off un-mailed letters and bought 25 watt bulbs to save electricity. Despite all this, Faith found it difficult to stretch her more often than not out of work and out of luck husband’s salary to cover all their expenses. Just as most struggling middle class families did, Faith tried to shield the truth from her children but her 8-year-old daughter Helen absorbed it all. She watched as her mother Faith suffered in silence, not unlike the long, self suffering heroines on the radio soap operas she so customarily enjoyed. It was just an ordinary Tuesday afternoon, but one that would be transformative in Faiths life. Mired in melancholy, she straightened up with an extra groan and turned to the arduous task of washing the family laundry accompanied by her familiar air-wave companions with whom she vicariously navigated the emotional waters of joy and despair. As she scrubbed the family clothes on the well-worn washboard, her daughter Helen sat at the oil cloth-covered kitchen table and did her homework. Hands down, Faiths favorite program was “Oxydol’s Own Ma Perkins,” lovingly known as America’s Mom, the sage widow who had her share of tears and offered homespun philosophy to troubled souls in need of advice. The baritone voiced announcer continued excitedly : “I want to tell you something that will be of vital interest to housewives a remarkable new laundry soap making other products out of date. Oxydol. Faith straightened up from the steaming washtub and listened. Here was a golden opportunity knocking right at her door! The contest offer was as sparkling and glowing as the promise made by the laundry soap tempting her with a life filled with less drudgery. “Here’s all you do,” the announcer explained. “Just complete this sentence ‘I like Oxdol for washing clothes because…’ Just finish the sentence in 25 words or less. It may win you a crisp, new $1,000 bill. Just enclose it with is a box top from a package of Oxydol. Knowing Faith was as clever as she was crafty when it came to writing, Helen encouraged her mother to enter. Imagine, they could be $1000 richer in just a few days. Suddenly, watching her mother rubbing her red rough hands, it came to Helen in a jiff. The following week when the winners were announced on the show, mother and daughter were over the moon. Imagine ! Faith was third prize winner of a crisp $100 bill. Ma Perkins had made sure there were brighter days ahead for the Lowe family. Crisco Slogan contest. $5000 in cash is top prize in each contest all in one lump! What a thrill! And a 1000 Sunbeam Mixmasters the pride of any kitchen each a $23.75 value. It didn’t take long before Faith and Helen were hooked on entering contests of which there was no shortage. Their days were a jumble of jingles, limericks and clever slogans, and these snappy skills honed at an early age would come in mighty handy when Helen ran a household of her own. The end of WWII ushered in the golden age of post war abundance leaving Americans with no restrictions on how much happiness we could buy. 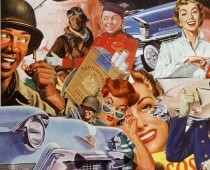 It also heralded the golden age of advertising contests, offering a fast track to the consumer drenched American Dream. Now a suburban housewife with a family of her own, Helen put her jingle writing skills to the test once again. Straddling two busy lives as a successful homemaker and useful civic leader when she was done with Goodwill she’d sit at her kitchen counter putting pen to paper, entering as many contests as she could to better her odds of accelerating that American Dream. And that dream home was now to be filled with all sorts of new and sparkling consumer goods from televisions, percolators, and power tools, to stereos, station wagons, and freezers. No longer mere cash incentives, contests now offered consumer a cornucopia of consumer goodies. Easy living tips to help you win! The key to this picture is convenience and economy. Cooking in advance. Buying in quantity . Foods always on hand are just a few of the things right with this picture. There are many more. How many do you see? Imagine if you’re the winner in the great Swifts Cleanser contest –you can buy anything you like at your favorite department store. Get a mink coat, beautiful furniture, outfit the family, redecorate your home. Swift and Company pays the bills. Think of walking into Marshal fields in Chicago or Hudsons in Detroit with $5,000 to spend. Also 50 second prizes Bendix automatic washers,300 Westinghouse Electric roasters, and 300 GE automatic coffee makers. Grand Prize Full operating income of a producing oil well ( subject to usual farmers royalty) Independent petroleum engineer estimates winners first years income at $12,000 gradually less yearly income for as long as 10 to 20 years. Total may eventually run as high as $35,00. Win cash equivalent of your weight. Check the chart and see how much you’re worth in solid gold. That’s the amount you win in cold cash in gold no mater how much you weigh. Win a lovelier figure! Prizes include all expense trip to Paris for 2 and Paris originals and 151 complete course in famous slenderella salons. Just finish this statement I would like to win a slenderella course because….. There was little Helen wouldn’t do to win. She might pack on the pounds to win her weight in gold one week, and starve herself the next to win the Libby’s slim down sweepstake. Like most post war vets and their wives Helen and her husband Tom grabbed for the good life with gusto. They wanted everything at once – the house, car, children and automatic washing machine. It was a new colorful world of unparalleled ease , the most wished for never before things, things that would make you proud of your choices and the envy of others. But like lots of Americans who went on a buying binge, Helen brought things on credit. For many the path to the American Dream was paved on the installment plan. Buying all that it took to participate the American dream put Americans deep in debt. The new post war breadwinner now joined that new breed of post war consumer – owing more than you had. Being in debt was the new American Way. Advertising contests now spoke directly to the new American dream – paying off your debts and giving you a fresh start. Out of debt, cash in the bank. Make all your dreams come true! Win French’s Fresh start Contest and free yourself from money worries! These are only some of the debts covered: home mortgage, property taxes! Time payments for automobiles, and appliances, and furniture. Medical and dental bills! In 25 words or less tell which one you like the best and give reasons for it. Sweet heart Soap 1958 ad. The Most exciting contest of all time. First prize every cent you owe will be paid in full up to $25,000 on all your personal debts of record that are unpaid as of Sept. 1958. You can apply against mortgage loans, lease, car payments, home improvements, installment payments furniture, appliances, medical bills and taxes. We’ll pay your mortgage, your car loan, your installment payments in full! Imagine the relief, the peace of mind the wonderful feeling of not owing a single cent to anyone! Think of being able to use your paycheck for the things you want instead of having to split it up a dozen ways to pay overdue bills! Imagine being able to put money in the bank, insure the children’s education buy new furniture, improve your home, take that long postponed vacation! A chance like this may never come again. Getting out of debt…the new American Dream! I did win $1,750 once in a TX lottery and stopped playing after that. I bought a great London Fog topcoat and a new fax machine! Ha, weren’t the ’80s just great? Poor people are also expected to use public computers to file their taxes and apply for health coverage — exposing their confidential information to connections that we are warned are insecure. The widespread assumption that “everyone” is now online is made by people who don’t have to choose between paying their heating bill or their water bill. Will Rogers once quoted an American president who said, “Everyone I know is doing well.” Exactly…. Everyone a rich man knew. I don’t think “The American Way” post-1945 to present day could have been graphically summed up any better Sally. This also adequately shows the power of American marketing: “more money” equals more happiness. “More stuff” equals more happiness. “The right stuff” equals the right body! “More debt” equals more dreams coming true! More, more, more, ad nauseam! Using these contests as a metaphor for our consumer culture, it was startling to see just how perfectly they fit the trajectory of post war America’s escalation of consumerism, and the ultimate cost of trying to achieve that – being up to your neck in debt. Exactly Sally. I’ve noticed family and friends who, though doing extremely well earning rich wages or creating a business or corporation and benefitting from its profits, fall into the trap of needing more money to PROTECT their attained wealth, and needing more TIME to secure/protect those acquired assets (or debts), ad infinitum. When does it stop? When should it stop? Furthermore, is it ethically good or wise to hand over excessive amounts of wealth and possessions to descendants — who did little or nothing to create it — giving in a sense a Free Meal Pass (for life?) along the lines of Donald (t)Rump? Hmmmmmm. You’re tapping into my American Dream…having an oil well in my front yard. Don’t people know by now that the ‘House’ always wins? That’s with casino’s, lotteries and elections! Yep, there’s always hope.